Dance party tour in Washington DC THIS SUNDAY at Comet Ping Pong! Kid Congo and the Pink Monkey Birds, DJ Jonathan Toubin, projectionist Spencer Bewley, NYNT Mummy Dancers, costume contest, and more are on tap! A NYC Halloween tradition for over a decade! And a dance party in a haunted house! 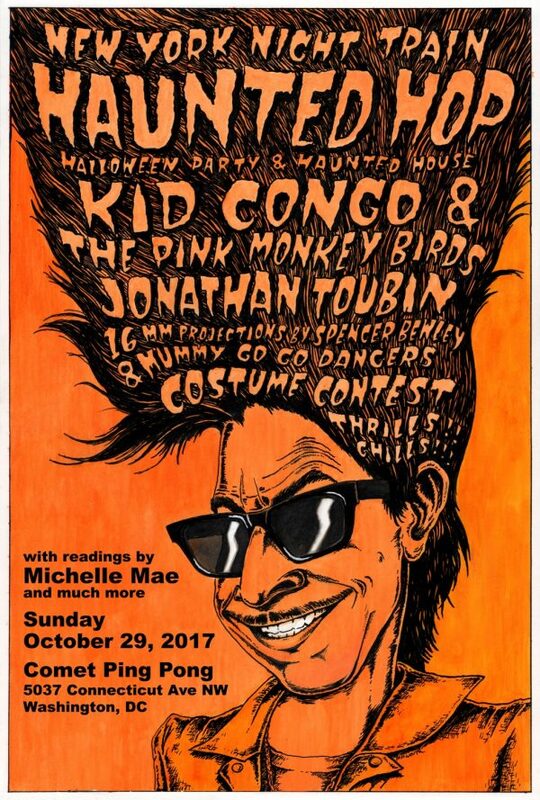 Led by Kid Congo Powers (The Cramps, The Gun Club, Nick Cave and the Bad Seeds), Kid Congo and the Pink Monkey Birds, the perfect Halloween band, play live and in person this Sunday night in DC! This all ages party kicks off at 9:00 PM at Comet Ping Pong, 5037 Connecticut Avenue Northwest Washington, DC. Soul Clap and Dance-Off DJ Jonathan Toubin busts out his world-famous o.g. spooky novelties and horror rock 45s for doing the Monster Mash all night, accompanied by his Mummy Go Go Dancers as virtuosic visuals cult hero Spencer Bewley juxtaposes film loops by hand on three 16mm projectors! Midnight costume contest, smoke, cobwebs, and much more… An early Halloween (trick or) treat!